Updated Friday January 25, 2019 by Alpharetta Youth Softball Association (AYSA). 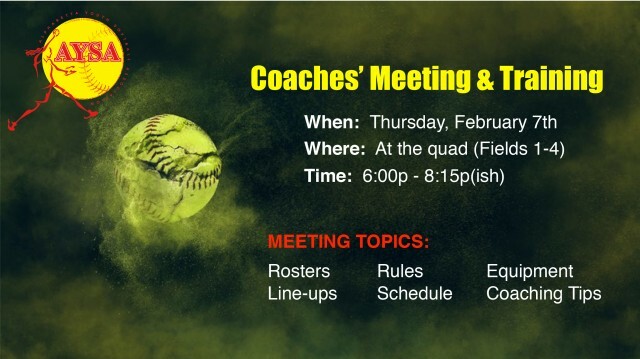 There will be a coaches' meeting and training at the quad on Thursday, February 7th, from 6:00 - 8:15(ish). It is mandatory that every team have at least one representative there, though all coaches for a team are welcome and invited. The head coach should try to make this meeting, but if they can't, the assistant or a team parent must attend. "All coaches - I strongly encourage you to attend this meeting. It will go a long way in setting you and your girls up for a fun and successful season!"